Blend one scoop of whey protein (24g) with 125ml (half a cup) of water, juice, milk or yoghurt. For best results, use an electric blender and drink within 20 minutes. Drink Precision Engineered Whey Protein any time during the day as needed or 1 - 3 times per day to add extra high quality protein to your daily kilocalorie intake. Ensure adequate hydration during and after training. 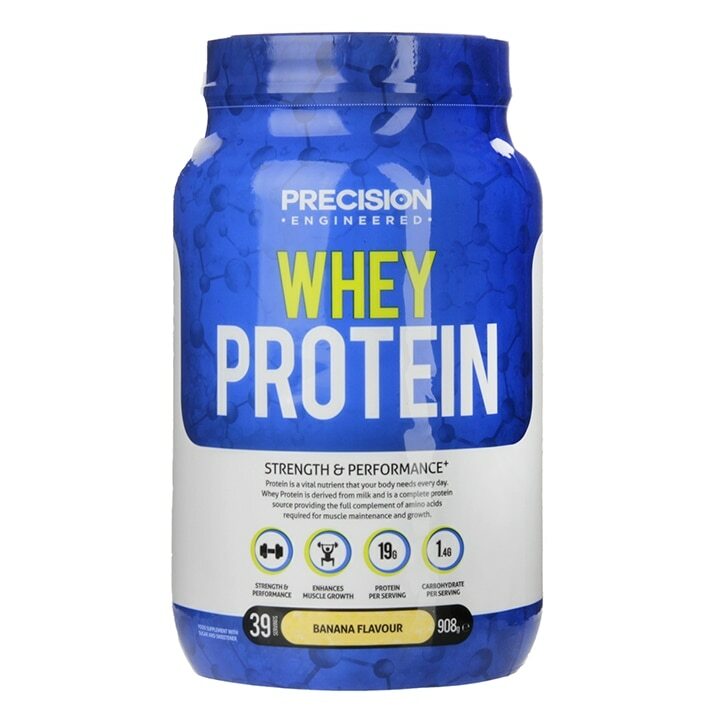 Protein Blend (Whey (Milk) Protein Concentrate (WPC80), Whey (Milk) Protein Isolate, Hydrolysed Whey (Milk) Protein), Bulking Agent (Xanthan Gum), Banana Flavouring, Caramel Flavouring, Emulsifiers (Soya Lecithin, Acacia Gum), Sweetener (Steviol Glycosides), Maltrodextrin, Coconut Oil, Sucrose, Antioxidants (Sodium Ascorbate, dl-Alpha Tocopherol), Beta Carotene, Anti-Caking Agent (Silicon Dioxide). Precision Engineered Whey Protein Banana is rated 3.6 out of 5 by 143. Rated 1 out of 5 by Scottie951 from Awful Having used this protein in the past I found myself buying again. On the plus side mixes well then you drink it. My god it was Horrendous, a hint of banana followed by a lingering chemical aftertaste.